The Z300 is Kawasaki's entry into the small capacity naked affray. On initial inspection it appears to be a Ninja 300 without clothing and comparing the specs on Kawasaki's website seems to confirm this. It's a handsome thing if you like the looks of the Z1000, luckily the 300 has not inherited the ridiculous headlight on the latest Big Z. As with most modern nakeds there are massive shoulder pads on the tank which do nothing except try to make a motorcycle look like a cartoon bulldog. In a departure from the naked theme though there are side panels and a belly pan on this 300 making it "upside down half faired" - normally half faired bikes have the fairing around the clocks not the engine. Handsome. Notice the side panels and belly pan. Parts-wise it is as you'd expect. Parallel twin, single disc front and rear with ABS, forks are the right way up, 2 wheels, a seat and even a petrol tank! So no surprises here then. The bike I'm test riding is fitted with an Akrapovic exhaust which is smaller and likely a tad fruitier than the original monster the standard bike comes with. This is cheating as far as I'm concerned, I'm not actually testing the bike I would buy direct from Kawasaki but I'll let it go. There's nothing trick here, just good solid proven engineering. Starting the engine reveals the Akrapovic is fruity but not loud. The 180 degree crank makes the engine sound more like a single with a low "dum dum dum" beat from the rear. All the controls are familiar and well placed, light to the touch and react in a normal sensible fashion. The seating position is slightly forwards over the front end which I like although the pegs feel quite high, more sport bike than street bike. I guess Kwak haven't moved them from the Ninja 300's racing position but with the upright handlebars it makes it feel initially unnatural. After a mile or so I no longer notice. The engine layout shares much in common with the MT03 I tested recently yet it is completely different in character. Being stuck in the 30 zones it is happy enough at the lower end of the rev counter but it is completely flat. A flick of the throttle is met with a gentle if not sedate increase in speed and while climbing a short hill I had to drop a cog or two to stop the motor bogging down. On paper I know there's 5 more horses inside the engine than the MT03 but those horses are not to be found below the mid range that's for sure. There's some power in there...I'm sure there is. When I finally get out into the country I manage to raise the revs and I'm rewarded as I would expect to be with a surge of power that sees the countryside turn into a blur. Oh yes indeed this is a spritely little motor but it needs to be wound up before it comes alive, much more akin to a 2 stroke. As I roll back into the 30s I get to thinking - is the peaky performance a good thing? For myself, no, but it is a matter of preference. The engine is timid and calm around town then you can get out into the sticks and give it the beans just like your favourite motorcycle racing hero. Best of both worlds? When you open the revs and you look at the rev counter this motor is no more or less "revvy" than the MT03, my CBF 250 or most other bikes in this class - but it SOUNDS revvy. At 5k with the Akrapovic I can't help but feel like I'm wringing its neck if the noise from the exhaust is anything to go by. It takes me a while once more to adjust my ears and accept the scream is not an indication that the engine is about to explode. If you like to emulate your racing heroes then fabulous but I just can't help feeling sorry for those poor little valves. Any magazine journo would talk of handling mid corner, braking effects on various surfaces and of ABS interference. I'll tell you what I can - the bike rides very well with no alarms and no surprises. Sounds dull? Maybe but for me this is a massive positive for the Z300. In the real world of potholed roads, peculiar cambers and manhole covers the tyres work well and the bike is completely stable even over those random patches of loose stone found on winter roads. Around town the balance is solid and once I get used to finding those high up pegs it is easy to ride. I do want for a little more bottom end punch in the engine department though. Fresh tyres and chicken strips. I ain't no hero. When the motor can be given the revs it demands everything still works well. The suspension is a little stiff for my taste but this bike only has 10 miles on the clock so that should loosen up a little. The riding position being quite forwards allows a firm grip on the front end which is reassuring. I'll not pretend I'm fast so I'll say the bike is more than good enough for the speeds I can manage and it did not scare me or try to throw me off. So what has Kawasaki given us? A naked Ninja 300, that's all. If you are in the market for a small capacity sports bike without the head down arse up riding position then the Z300 is for you. It will scream in delight with you as you rip up the countryside tarmac and you'll look cool afterwards parked outside the cafe. Just like the rest of the Zed range this is a muscle bike, this one's just shrunk in the boil wash. It is a well made piece of kit and should prove to be an absolute hoot in the right hands. Then on a Monday morning it will still run you to work without trying to rip your arms out or spit you off. Oh...my opinion? Too peaky for me. 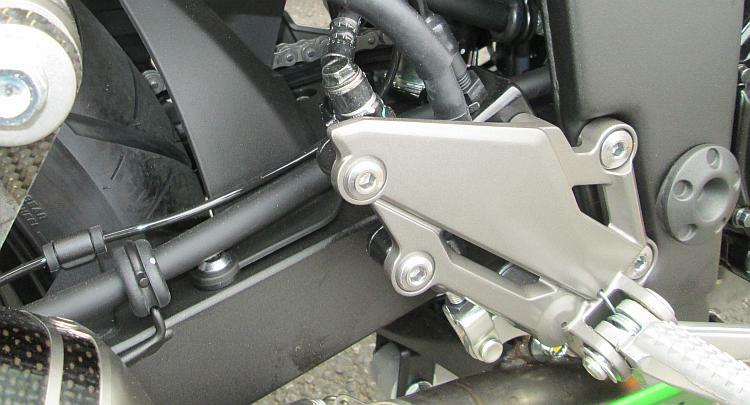 If Kwak softened the cams for more bottom end and dropped the footpegs an inch then fabulous. I'd have to look at the fuel consumption figures too. If it returned 80 mpg or more with bottom end then it would be awesome. It wouldn't be too hard to lower them a little...would it? Why not consider the Z250sl (sl =superlight) instead? RRP £3699 OTR , Green or Black. only thing I did not like, was the rock-hard suspension (nitron do a upgraded/custom rear-shock-£400) & thin seat padding. The bike was much lighter and slimmer than the z300 twin sat beside it. I feel only major negative, the bike would not be comfortable to ride for more than an hour or so. I decided to get a Ktm Duke 200 instead, £2995 on offer, with ABS. David Barwick - You sir are completely right! I initially asked to try the Z250SL because this strikes me as being more suitable to my riding style and my needs. 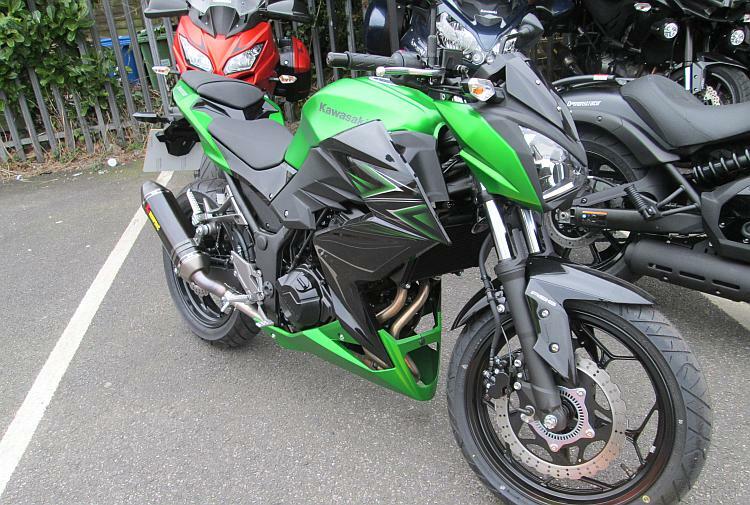 However the local group that sells Kawasaki does not deem it worthwhile to have a 250 demonstrator. Apparently those who buy 250s are those who have recently passed their test, and their test ride insurance requires anyone taking a test ride must have held their licence for over 1 year. Go figure. Obviously the 250 will not be as powerful or fast but being a single I suspect it will be more grunty throughout the rev range, and that for me is more fun. It is also lighter. As for the comfort, ergonomics are a peculiar thing and quite individual. The only way I could judge the comfort is to try it for myself. Comfort is important though. I find most modern bikes have fairly firm suspension, I'm also aware the gf's 125 was very firm at first but softened up with usage. I do rather envy your KTM 200. Basically it's the best of 125 - light, nimble and fun with the extra poke that a 125 lacks. I do believe KTM has stopped importing them. I wonder if the KTM would be just a little too radical and aggressive for my own style. I'd love to hear your thoughts on the 200. Yeah, its really impossible to commit to a new bike purchase without being able to test ride it. How can you know if you could live with it long-term. I understand the z250sl is more torquey low down than the hi-revving z300, and will pull smoothly in any gear from 2000rpm +. 250 seems an odd capacity now, shame that such a cracking little bike like this is all too easily over-looked, especially by dealers. You are right about the Duke 200, same as 125, but more poke, so no need to thrash it, just use the torque, but with power in hand for safe overtaking - my only issue with the 125 bikes I have owned recently. 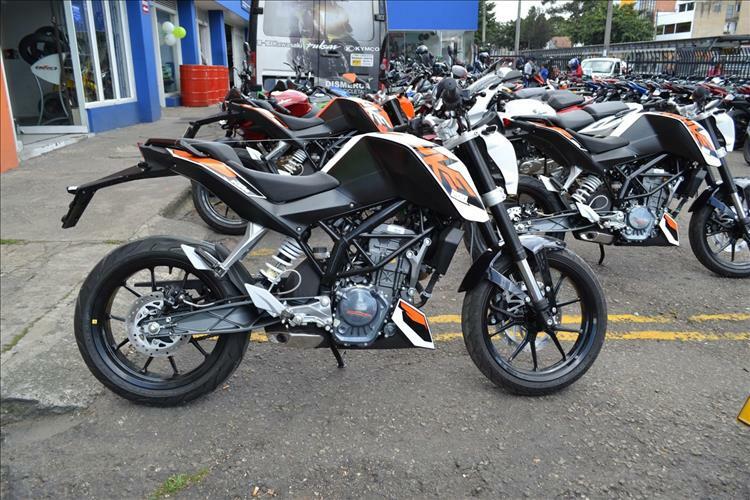 You are correct,the 200 is no longer a current KTM model in the UK, however some dealers had a few new ABS 200s on offer recently around £2995. so I got one registered 2/3/16 brand-new. hear in exposed Norfolk have been using my "Winter" bike - Rieju Tango 250 Trail, however will be happy to report back with my thoughts soon. Sitting on the bike, the position feels very natural and relaxed, the suspension feels plush front and rear, soft-ish but well-damped, especially in direct comparison to the z250sl, and the seat feels much better too. I have fitted some soft luggage, Hein Gerick panniers, tank bag and tail bag. Have Recently Purchased A New Z300 And Find It Excellent - I Own A 600 R6 And A 125CC And Wanted This For Trips That Were Not To Far - To Fill The Gap Between The Other Bikes. - But It Has Now Done 1000Miles! Mpg Has Been Around 75 To 80. Slipper Clutch Feature Is Also Good Giving More "Direct Drive". Oil Filter Is Screw On Type Which Is A Bonus. Thanks Mk. You have the perfect selection of bikes now huh? R6 for blasting, the 125 for pottering around and now the Z300 for that ideal halfway house. Considering the 44ps performance that 75-80mpg is pretty good. I'm guessing if you're not giving it large all the time it ought to be quite frugal. Yip, it has a proper filter that ordinary folks can change too. It's a well thought out machine. 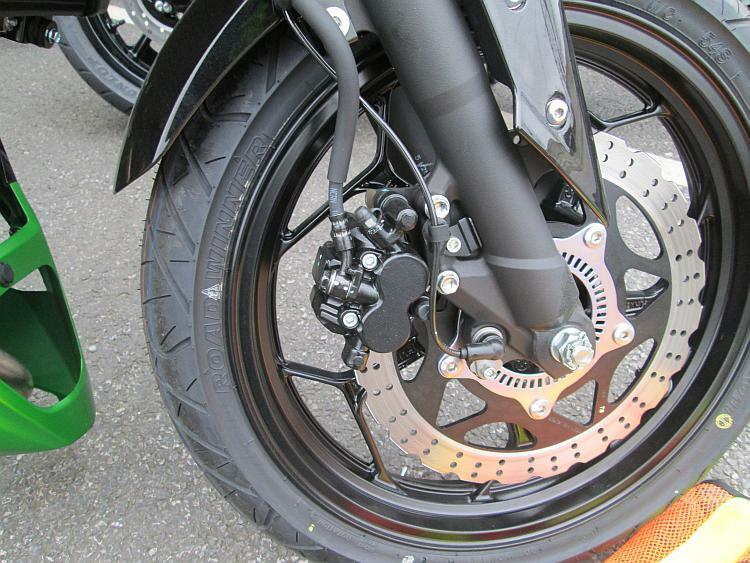 I certainly didn't notice the slipper clutch but then my riding style is far too sedate to bring that into action. That's a great picture too. Where was it taken, it looks quite lovely. David Barwick, sounds like a good deal on the Duke. Does the fact that it's discontinued bother you at all? You see my CBF 250 was never a big seller which means finding aftermarket or second hand parts is a nightmare. Opposite to that the CBF 125 was a massive seller and I can find almost anything for that bike. I've not seen many 200 Dukes on the road and as it's no longer being sold here I'm just curious. When you've put a few miles on the beast and had chance to form some solid opinions then drop me an email, renwithnell@hotmail.com. Hi. I put a deposit on a z300 yesterday. Not quite sure how that happened. I thought I'd convinced myself that my wheezing wallowing CBF125 was perfectly good for my needs. Keith: Amazing how things like that happen, it is almost like your wallet and hands have an independent life of their own without ever having to consult your brain. There are a few items around my house that I still can't recall the exact details of their purchase. Just that I was outside the shop with it in my hand and no-one chasing me for shoplifting. "wheezing wallowing CBF125"!!! How very dare you Keith m. My wheezing wallowing CBF125 has seen me right for years now and keeps on wheezing and wallowing along. You folks really must learn to keep a tighter grip on your wallets. We can't be going around buying new motorcycles willy nilly what will the world come to? That said Keith - do report back regarding your smashing new purchase. When do you collect it and have you reached that part where you go dizzy with excitement every time you think about it? Your right the CBF125 is a brilliant bike. I brought a 2010 model,(with a unbelievable 3000 miles on the clock) last year to see whether I wanted to ride back on the road again after stopping when I started trials riding. But they are so easy to ride and very forgiving although I do miss not having a rev counter to see how hard that little engine is working. As for getting excited about my new bike I actually get a bit apprehensive. Because although you do all your research and test ride you never know until you've got a few hundred miles done if it's exactly right. But the z300 did seem to tick lots of boxes for me. I'll let you know how I get on. Hopefully pick it up this weekend. Yeah the CBF125 does exactly what it says on the tin. Cheap, effective, efficient and pleasurable motorcycling. After 58,000 miles I'm still enjoying riding mine. If only there were such a thing as a 500 mile 3 day test ride? It's ok riding a bike for an hour but to sit on it for 4 hours is another thing. To see if it'll fit in your shed, what it's like on your commute and how it feels with ya mate on the back is what you really want to know. Perhaps that's why they don't allow you to keep the bike for 3 days? Just wanted to put an owner's view on a z300 now I've put a few thousand miles on it. When I did the initial test ride on this I completely agreed with Ren, peaky and needed to go in search of the power. But now I've got used to it and the engine has freed off it doesn't appear to feel like that anymore. Yes the throttle gets more responsive at 4k and a bit more at 5k but to be honest I find myself at 4k plus in just normal riding. But below 4k is superb for filtering in traffic in town, 1st or 2nd gear clutch out and very docile. Country A and B roads it's possible to just put it in 6th and just roll on and off the throttle from about 40mph. You can play tunes on the gearbox if you wish and I'll be happy to respond but doesn't really need it to "make progress". Rev limit is at 13k but I've never got there and quick overtake needs no more than 8k. I've been very impressed with this bike it's light responsive, and a pleasure to ride. 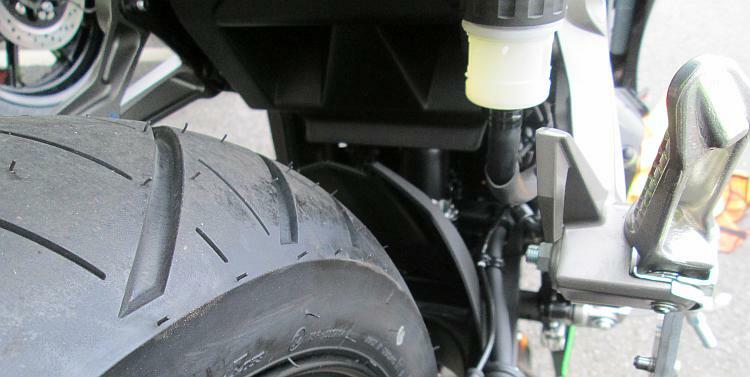 As a bike to get you to work during the week and take out on a Sunday without worrying weather your licence is in tatters it's definitely worth a look, just change those standard IRC tyres. What is it with original equipment tyres? The ones on my 500 were blooming awful. I really appreciate your contribution Keith M. Whenever I manage to wrangle a test ride from a dealer the bikes are near-as-dammit new which often gives a mis-guided representation of the model. I'd like to test your bike to see what it's like once it's all settled in. Enjoy the Z300 and keep us informed. I always like to know how well a motorcycle ages too. OE tyres really annoy me, I know bikes are built to budget but tyres are the only thing that keeps us the correct side of the hedges. It's a shame I live down here in the south east otherwise you could have taken my bike for a run to get a second opinion on it. What might have not helped yourself was having a none standard exhaust on the test bike so made the bike sound more buzzy than it is. I'm sure I can hear the airbox more than i hear the exhaust. When I bought the bike the mechanic in the shop had previously owned a z300 and he had said himself that the engine would feel different with miles on it. I wish these weren't branded as a beginner bikes by the press and internet I'm sure that doesn't help their sales and they are so much more. I'll keep you posted how get i along. One last thing why can't we have the red and yellow ones as in other countries, surely they came off he same line? I too despise this idea that anything under 1 million CCs is for learners, lightweights and those that aren't tough enough for a "proper" motorcycle. A 125 is more than capable of riding around the globe and a 250 will sustain legal highways speeds just fine. It would be all too easy to lose your licence on that 300 so do you really need any more? Thanks for your information on your Z300. It is always great to have real reviews from people actually owning the bikes. Like you I too believe the smaller cc bikes are far more than just beginner bikes. They are so much fun, light and fuel efficient amongst other things. The manufacturers really do under sell them. I also get frustrated by lack of choice in colours in the UK bike market. I covered this in a blog post. Link added below for you. It seems that us British are still seen as somewhat staid. But the truth is I am sure many people other than ourselves would like some colour injected into their lives. As I said last time, just get it sprayed. I'm currently having a professional job done on my Guzzi tank, side panels, mudguards and headlight brackets. Less than £400 and having seen the chap's work I think the job as they say will be a good one. I probably also said that I think current colours tend to be grotesque but may be showing my age (or well honed sense of taste). £400!!!! Goodness gracious man, we're not made of money. I daresay if you're spending several thousand pounds on a brand new motorcycle then you might feel a little perturbed to not get it in the colour you desire rather than having to go and spend a few hundred more on getting it sprayed. As for the colour trends - yeah it's a matter of taste. I've read a few people who think the beige of my 500 is revolting and grotesque. For me it was the tan colour that clinched the deal. So instead of buying the brand spanking new machine you get a demo / pre-registered bike instead, saving more than the £400. Get the dealer to remove the parts as part of the deal (ISTR Sharon is adept at this sort of thing). Deliver to your painter of choice then get the dealer to refit. My bike was a demo with a mere 300 miles on the clock but luckily I like green it came in. It would be nice just to have a few more options. Ren: There's me thinking I'd be safe offering a ride on my bike when your 200miles away,he'll never take that offer up, and you tell me you have family an hour from my house. HA! Now you'll think long and hard before you tell me where you live. Sharon - I can feel a trip to my Dad's place coming soon. Back in mid May I took the z300 to Northern Ireland for NW200 road races. Kreiga luggage strapped on we did a total milage of 1400miles in a week. Which for someone who uses this bike for commuting and ride out on Sundays is a huge milage. The bike was superb,it easily and happily held 70mph on the motorway.My only concern at 70mph is the engine is pulling 8000rpm. I know its 5000rpm off the red line but its still 8000rpm and I would have liked a temperature gauge. I should have done some fuel figures but didnt. I know that from Dumfries to M61 services at Bolton it returned about 70mpg.I didnt suffer from any aches from shoulders or wrists but my knees were screaming but I think thats my knees and the fact that I ride with my toes on the footrests. I doubt Kawasaki designed this bike to do this but it did without complaint. It sounds like you are enjoying the z300! As Ren said in the opening review, the z300 is not anymore revvy than most other bikes in this class. My inazuma 250 is reving at over 8500 at 70mph, and at 75 it is reving at exactly 9000!!! Yeah true. I just can't believe all those parts don't just fuse together at such speeds. Thanks for the update. Fantastic to hear of someone else making the most of their smaller bikes. You said you don't think Kawasaki designed this bike for long trips. I disagree in so much it is a false perception of many that smaller bikes would struggle in longer adventures. 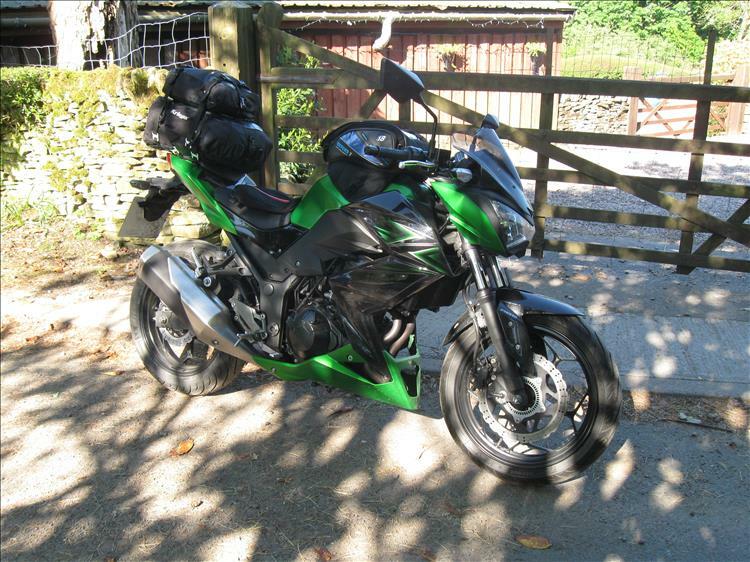 I have just taken my Kawasaki Z250 to Spain and like your Z300 it handled it with no problem. The Z250SL regularly returns around 90 to 100 mpg. Hope you have many more adventures on this bike. Cheers Keith. There are good scientific reasons the parts don't fuse together at high speeds...I'm sure. I suspect oil has something to do with it. M61 services Bolton? You were but a mere mile or so as the crow flies from my humble abode. What on earth would persuade you to visit Anderton/Rivington/Bolton North services? It's hardly a hub of culture and entertainment. Anyhow Dumfries to Bolton? My CBF125 has been to Dumfries and then beyond to Ayr and survived. It had a night's rest then went to Fort William then another rest and on to Ullapool. Glad you're liking the Z300. I am aware a certain lady has her eye on the newer Z400 but I think she'll need to rob a bank before she can afford it. Bolton M61 services was for fuel only. I was heading for my overnight stop at family just outside of Buxton. I didnt want to have navigate the Manchester ring road and worry if I and enough fuel. At £1.46ltr it must be very special fuel!. The z400 looks like a fine bike. They have reduced the weight increased the power so probably better than the Honda cbr500. But colours please Kawasaki. Being local to the area if you'd have come off the motorway 1 mile later and gone to where the football stadium is then you'd have spent a little less on fuel. That's the power of local knowledge. Motorway services sure know how to sting. is worth to pay 1100 euro more to get the honda cb500f 2018 , or is better to buy the kawasaki z300 together the price with new tyres pirelli diablo. with the difference i can buy a very good helmet and a very good leather jacket. what is your opinion? the bike i want only for city use and max 100 at freeway for short trips. thanks. honda cb500f 6300 euros , kawasaki z300 with new tyres pirelli 5200 euros. Oh my! I can only offer an opinion I cannot tell you what is right for your good self MP. While there's not a great deal of difference the Z300 is lighter by about 20kg. I daresay the Kwakker would just about have the upper hand around the city. The Z300 is only 6hp less than the CB500f but the Z300 needs to be revved to reach those horses. Now if you are of the mindset "faster faster faster" the power of the 500 is more accessible. If however you want an easy ride the lack of low down power on the 300 is an advantage. It means the engine is soft, kind, gentle low down and if you need the power one day let the revs rise. Check out servicing costs. While the Kwak is cheaper to buy it needs servicing more often. If you do a lot of miles the savings could be eaten in service bills. If you don't do a lot of miles then you'll be fine. Get a fixed price for servicing with your deal so you can compare prices. If you're always in the city and not doing big miles I'd lean towards the Kawasaki. But keep an eye on the service costs. Thank you for your replay. i am not faster faster faster. you help me a lot. Whatever you decide on MP you'll enjoy it, they're both great bikes. one more question.about the colour.i see everybody takes the kawasaki green.ok kawasaki is the bike ,green is the colour that fits on it.what is your opinion about black ? unusual for kawasaki .here at greece all kawasaki are green ( also the photos i see here ).if i take black just for change am i going to be so wrong? Colour is a personal choice. 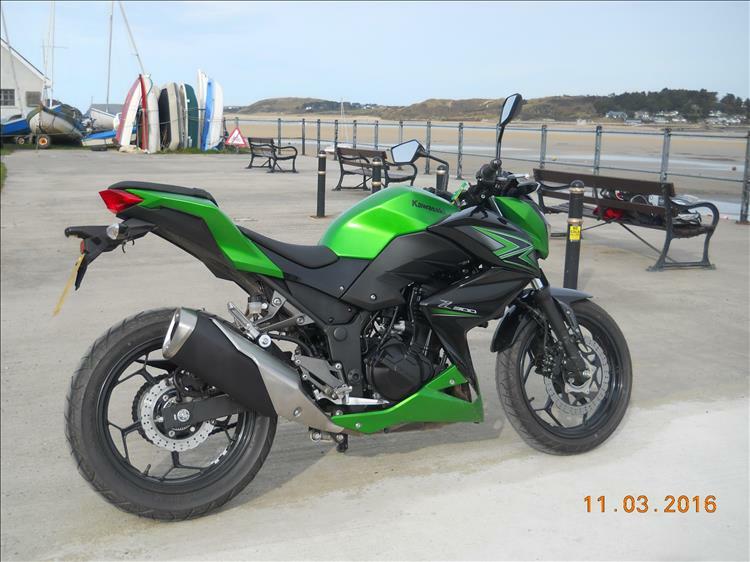 Except Kawasaki haven't given us much choice with this bike in Europe, it's green or black. If you prefer the black then buy a black one. It won't handle any different or go any faster than a green one. Buy what you personally want. Keith's right. Look at them both and buy the one that catches your eye most. Finally i bought the yamaha mt03. 5 days dalivery. Next friday. I think is the best option. 2018 model, gear indicator, and total naked. Black blue color. I have also for commuting suzuki burgman 200 2018 model. I can'wait to ride it. Ah so you went for the MT03 - a perfectly good choice MP. There is a review on here I'll add the link. That'll be a nice little stable you've got. The Burgman is ideal for the commute and the MT03 for playtime. Enjoy them both, I'm sure you will. Do please take your time though, there's no rush and plenty of time. You are right. One for commute the other for playtime. Is not need for bigger bikes in the city.